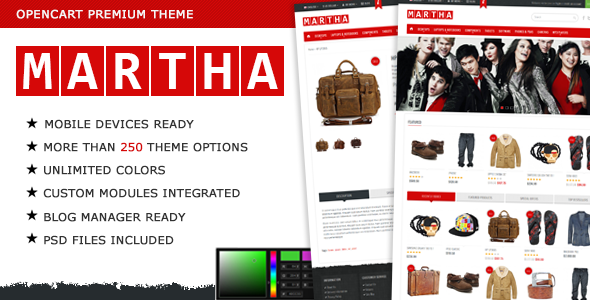 Martha is a Premium, Responsive OpenCart eCommerce theme with a clean and neat design. It’s perfect for any kind of web shop. It looks great with all types of devices (laptops, tablets and mobiles). It also includes a Theme Panel with more than 250 theme options and unlimited colors. More than 250 Theme Options (personalize your site). Blog Manager ready (Enjoy powerful blogging right from within your store. Zipp is prepared for the popular Blog Manager extension. NB! Blog Manager is not included in the theme package. You can purchase it separately here). Top Hidden Content Module integrated. Item Reviewed: Premium Responsive OpenCart eCommerce Theme 9 out of 10 based on 10 ratings. 9 user reviews.